Traditional Ayurvedic healing drink used to treat inflammation, such as in arthritis and bursitis, and to support the immune system. To make: combine the turmeric with 1/2 cup water in a saucepan. Bring to a boil, then lower the heat and simmer until the mixture turns into a thick paste. Cool, scoop into a glass jar, and store in the refrigerator. To use: To make one serving, combine 1/2 to 1 teaspoon turmeric paste, 1 teaspoon almond oil, and 1 cup milk in a blender. 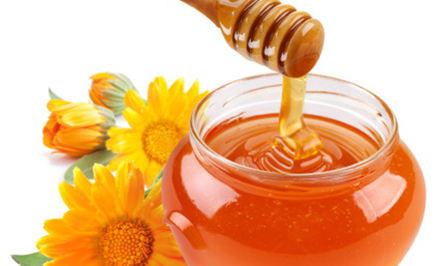 Add honey to sweeten, if you wish. Blend to make a frothy drink. Reprinted from Rosemary Gladstar’s Medicinal Herbs. Combine the ginger with 1 quart cold water in a saucepan. Cover the pan tightly and bring just to a boil. Remove from the heat and let steep 10 to 15 minutes. While the ginger is steeping, squeeze the juice from one or two lemons. Strain the ginger from the tea, if you like, and then stir in the lemon juice and honey to taste for the finishing. To use: Drink warm or hot. This is a herbal remedy for cramps, colds, congestion and fevers. You can use bottled lemon juice, but in the bottling process much of what’s good about lemons has been cooked out. Fresh lemons are the way to go. This recipe is from Rosemary Gladstar’s Medicinal herbs. 1. Halve, seed, and peel avocado. Transfer one of the avocado halves to a small bowl; mash with a potato masher or the back of a wooden spoon. Stir in mayonnaise, lemon juice, and garlic; set aside. Thinly slice the remaining avocado half. 2. 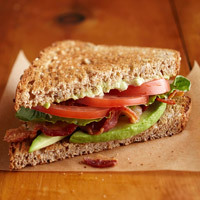 Arrange avocado slices, bacon, lettuce, and tomato on four of the bread slices. Spread the mashed avocado mixture over the remaining four bread slices; place on top of the filled bread slices, spread sides down. 1. Preheat oven to 400 degrees F. In a large bowl stir together all-purpose flour, whole wheat flour, sugar, baking powder, cinnamon, nutmeg, baking soda, and salt. Using a pastry blender, cut in butter until mixture resembles coarse crumbs. Make a well in center of the flour mixture. 2. In small bowl combine egg and buttermilk; stir in zucchini and chocolate pieces. Add the buttermilk mixture all at once to the flour mixture. Using a fork, stir just until moistened. 3. Turn dough out onto a lightly floured surface. Knead dough by folding and gently pressing it for 10 to 12 strokes or until nearly smooth. Pat or lightly roll dough into an 8-inch circle. Cut dough circle into 12 wedges. 4. 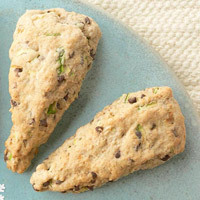 Place dough wedges 2 inches apart on an ungreased baking sheet. Bake for 13 to 15 minut.es or until edges are light brown. Remove scones from baking sheet; serve warm. Makes 12 (1 scone each) servings. **Test Kitchen Tip: To make 1/2 cup fat-free sour milk, place 1-1/2 teaspoons lemon juice or vinegar in a glass measuring cup. Add enough fat-free milk to make 1/2 cup total liquid; stir. Let the mixture stand for 5 minutes before using. Tip *Sugar Substitute: Choose Splenda Sugar Blend for Baking. Follow package directions to use product amount equivalent to 3 tablespoons sugar. Per Serving with Substitute: Same as above, except: 197 cal., 29 g carb. 1Heat oven to 350°F. Place pie crust in 9-inch glass pie plate as directed on box for One-Crust Filled Pie. 2In large bowl, beat 1/2 cup butter and the granulated sugar until light and fluffy. Beat in 1 egg at a time until well blended. Stir in almonds and 1/4 cup flour just until evenly moistened. Spread mixture in crust-lined pan. Arrange pear slices on top of filling, overlapping slightly. 3Bake 20 to 30 minutes or until filling and pears are light golden brown. 4Meanwhile, in medium bowl, mix 3/4 cup flour, the brown sugar and almond extract. Using pastry blender or fork, cut in 1/3 cup butter until mixture resembles coarse crumbs. 5Sprinkle raspberries over pear; sprinkle with topping. Bake 18 to 28 minutes or until topping is golden brown. Serve warm. Store in refrigerator. 1Heat oven to 350°F for shiny metal or glass pan (or 325°F for dark or nonstick pan). Spray bottom and side of 9- or 8-inch round cake pan with baking spray with flour. 2In large bowl, beat cake mix, zucchini, cinnamon, cloves, buttermilk, oil and egg with electric mixer on low speed until moistened. Beat on medium speed 2 minutes, scraping bowl occasionally. Pour into pan. Sprinkle evenly with nuts and chocolate chips. 3Bake 30 to 35 minutes or until toothpick inserted in center comes out clean. Cool completely, about 1 hour.